Last time, I wrote about the new bug with the Standard Pauper filter on Magic Online that now allows any Uncommon currently in Standard that was once printed at Common into matches. Obviously this would have a big impact on the metagame going forward. Simply go with the filter as is. The "Uncommon-Commons" would now be allowed into the format. Continue with the rules as they are. This means that despite the fact that players will technically be able to enter a match with illegal cards, once they are discovered, that player will receive a match-loss. Change the way registration works such that Gatherling enforces the rarity restrictions rather than Magic Online. Looking at the list of Commons that would be added to the format, only Arc Lightning, Gravedigger and Stab Wound would see widespread play with the potential to disrupt the format in an unhealthy way. The rest of the cards might find a home in particular archetypes, but aren't really broken or overpowered. But Gravedigger in particular is a strong card with no real answers in the format. Of course, the same might be said for Font of Return. Having new players enter what they believe is a legal deck, only to be disqualified due to a bug with Magic Online, seems like a good way not to keep new players. While MPDC worked this way for a long time, I have no doubt it hurt the growth of our player base. And having a filter that doesn't work properly only makes the problem worse, since the new players would have every right to believe that their deck was in fact legal. The third solution seems like a good idea, but in fact Gatherling doesn't actually work that way, at least not the version we use on pdcmagic.com. Even if you force players to enter a decklist to register, they can still just enter nonsense characters into the decklist and bypass that restriction. And it certainly doesn't tell a player that a card entered isn't legal for a particular format. So if we wanted to go down this road, we would have to switch over to the software at Gatherling.com, essentially leaving pdcmagic altogether. Hopefully this will all be a moot point. 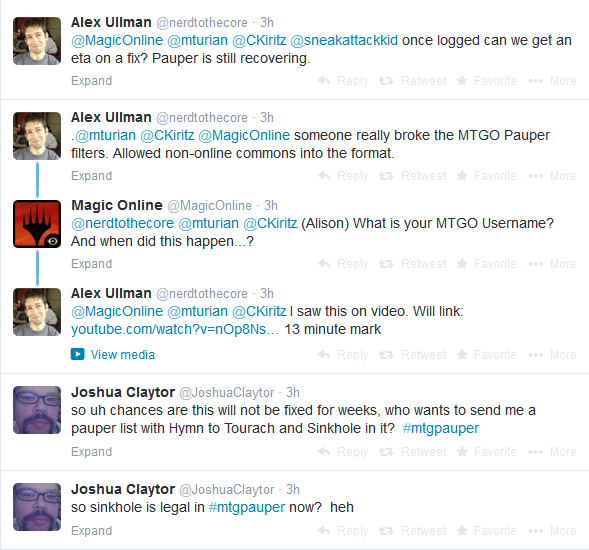 The Magic Online team is aware of the issue, and one can hope the problem will be resolved before the next season of MPDC starts. We shall see. Don't forget the 4th solution. You could contact Jamuraa and ask him to update PDCMagic.com with this code. I would be more than happy to resend him the code upon his request. He has already mentioned to me many times he intends to do so. But he is very busy. Sometimes just knowing there are people wanting an update motivates him. Especially if he is solving a problem such as this. Here is the video where Hymn to Tourach was cast.